If you know of any manuals or guides which are not yet listed here, or if you would like to contribute a new manual, guide or translation, please send us the file or tell us where we can download it. Thank you! NOTE: All HTML and PDF links open in a new window. A comprehensive User's Guide for Celestia version 1.6.0 / 1.6.1. 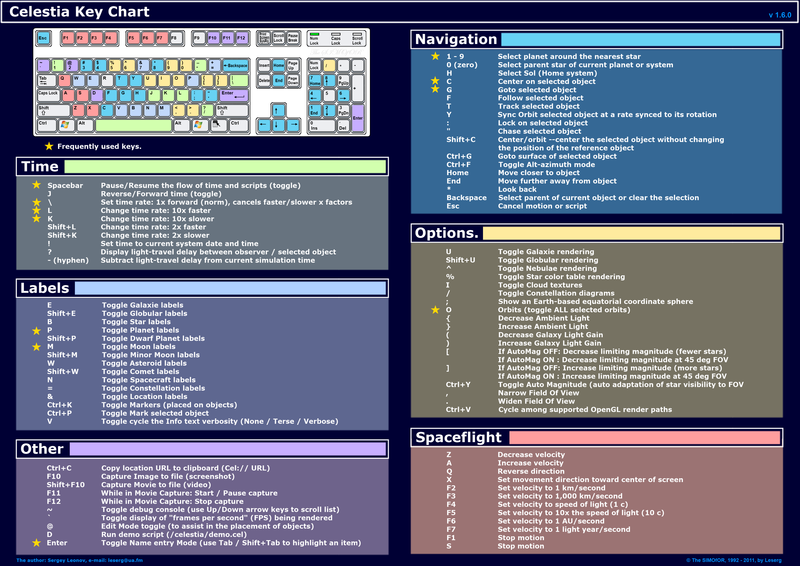 This key chart describes frequently used keyboard shortcuts. Unfortunately the key charts are no longer available at NASA. This 55+ page guide describes Celestia's 1.3.1 CEL scripting language in easy-to-understand terms and includes many examples. This summary describes the implementation of CELX (Lua) scripting in Celestia v1.3.2. For information on the Lua, the language, go to: http://www.lua.org/. A one-page text file that lists the current methods available in Celx, sorted by object. This document is intended to help people to migrate from CEL to CELX scripting. On the other hand it also contains a lot of useful information for those who are already using CELX. This guide describes the commands available for use in Celestia's 1.3.2 Solar System Catalog (.SSC) files. 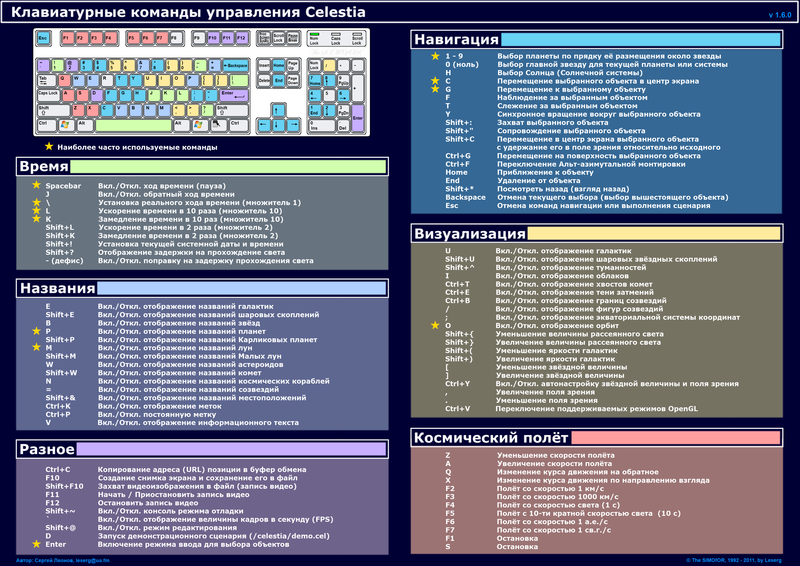 This guide describes the commands available for use in Celestia's Star Catalog (.STC) files. Creating and Using SSC Files by Selden Ball, Jr. 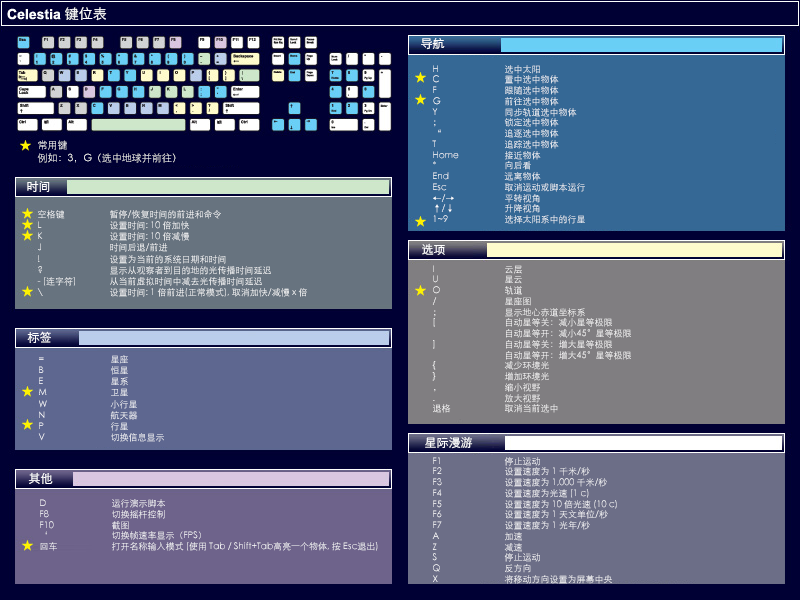 This guide describes how to create and use a Celestia Solar System Catalog (.ssc) file. Transforming Orbital Elements into Celestia's SSC File Format by Selden Ball, Jr. The International Astronomical Union (IAU) publishes circulars which have orbital elements for comets and for asteroids. This is a brief, incomplete, description of how to transform the IAU orbital elements of a comet or asteroid into Celestia's SSC file format. This guide explains what a Celestia Virtual Texture (VT) is, how to use them, and how to create them. The larger file includes the guide along with 512K x 512K VT/JPG textures for the first three levels of Mars. Virtual Surface Textures by Selden Ball, Jr. This is Selden's very educational page for Virtual Textures. Introduction to Celestia Add-ons by Selden Ball, Jr.
A (not so) brief introduction to Celestia Add-ons. Orbital Parameters by Selden Ball, Jr.
Information on the orbits and other properties of the bodies in the solar system. Information about the three laws of Johannes Kepler. A very readable compendium of information on the bodies in our solar system. Celestia Exploration Activity An online Exploration Activity by The Learning Technologies Project Office of NASA (with cel://URLs). Unfortunately this is no longer available at NASA. Selden's List of Resources for Celestia - Selden Ball, Jr.